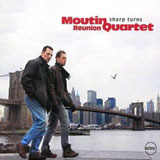 Back in 1999 Louis and Francois Moutin decided to form THE MOUTIN REUNION QUARTET in order to perform their original compositions. They had a common desire: to create music expressing the energy of life; full of emotion and spontaneity - a music close to them, to what they intimately feel, inhabited by Jazz' spirit, swing and grooves, inviting listeners and musicians to celebrate beauty and imagination. They are sharing this desire with their two outstandingly skilled partners: the amazingly talented pianist Pierre de Bethmann and the immensely gifted saxophonist Rick Margitza. Not only Rick is a former partner of Mr. Miles Davis, but also both he and Pierre can pride themselves on their profoundly creative and extremely successful respective solo careers. Since four years, the band is touring through both America and Europe, performing for more and more big and enthousiastic audiences. In 2005 they released their third album (in September), on Lightyear/WEA. Three years later, as a member of the legendarey Martial Solal’s Trio, Francois was recognized as one of the finest young bass players in Europe. At 29, he began co-leading the Quintet Moutin with his twin brother Louis, a top echelon Jazz drummer. This project has evolved into the Moutin Reunion Quartet. In November 1997, he moved his base to New York where he has found steady work in live performance and studio sessions with the premier artists on the New York Jazz Scene. A partial list of their names reads like the yellow pages of Jazz : James Hurt, Ari Hoenig, Jean-Michel Pilc, Greg Tardy, Gene Jackson, Dave Binney, Rudy Mahanthappa, Vijay Iyer, Adam Rogers, David Gilmore, Ben Monder, Billy Drews, Jamie Haddad, Steve Hass, Franck Wess, Jimmy Heath, Monty Alexander, Benny Powell, Richie Beirach, Dave Liebman, Clarke Terry, Oliver Lake, Harry Belafonte, Odean Pope, Don Alias, Rick Margitza, Mike Stern… Francois has also recorded and performed with Arab Music star Simon Shaheen. He is a familiar presence on the stages of such establishments as Sweet Basil, Birdland, Blue Note, Knitting Factory, Zinc Bar, Cornelia Street Café, Jazz Gallery, Tonic, Smoke, Lincoln Center, Town Hall, New York Symphony Space. François has also appeared at major Jazz Festivals around the coutry like Newport JVC, Bell Atlantic, Monterey, Kansas City and Detroit. Born in Paris on Chrismas Eve 1961, Louis Moutin developed an early passion for music, particularly Jazz, in which he becamed immersed thanks to the family’s record collection. When he was seven years old, Louis began teaching himself to play piano. At age 20, he chose to become a jazz drummer. At 24, after completing training as an engineer at the prestigious Ecole Centrale and receiving a Masters Degree in Mathematics, Louis decided to abandon a career in technology and to pursue his musical interests. Within three years, he was a member of the very successful Machado Trio, and was already regarded as one of the best European Jazz drummers, performing frequently in the international Jazz Festival network. At 29, Louis teamed with his twin brother Francois, a highly regarded upright bass player, to form their first group. This collaboration by the Moutin brothers drew praise from Jazz audiences and music professionals alike. 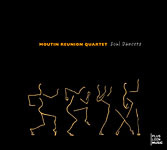 The Moutin Reunion Quartet, born in 1998, is a natural outcome of this collaboration. Meanwhile Louis has pursued a steady career as sideman with such renowned artists as : Martial Solal, Antoine Herve, Michel Portal, François Jeanneau, Manuel Rocheman, Michel Legrand, Christian Escoude, Albert Mangelsdorff, Andy Emler, N'guyen Le, Jean-Marie Machado, Jean Michel Pilc, Eric Lelann, Laurent Dehors, Simon-Spang-Hanssen. All About Jazz musician pages are maintained by musicians, publicists and trusted members like you. Interested? Tell us why you would like to improve the The Moutin Reunion Quartet musician page.